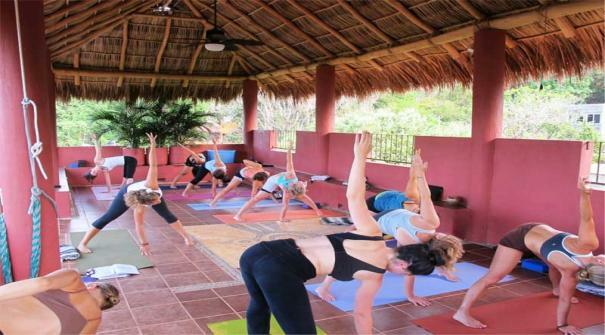 From the child’s pose to the eagle pose, yoga practitioners are stretched out along the rooftop palapa overlooking the Pacific Ocean as they participate in a the 200-hour Yoga Teacher Training Program held at Casa de Tortugas from June 1-22. The Master Immersion is led by Chrisandra Fox and Katie Silcox of 8drops Yoga. What an idyllic setting for a yoga retreat—the beautiful villa of Casa de Tortugas, in the quiet, friendly fishing village of Chacala. Casa de Tortugas is just steps off the beach and the Pacific Ocean, so yogis can practice their poses on the warm sand to the meditative sound of the waves.